With continuing economic pressure on colleges, students and their parents, new students at Geneva College have some new options for Grants and Scholarships that reflect the school’s continued focus on making education affordable. For the upcoming academic year, Geneva has increased the amounts of their academic scholarships and introduced or improved several new grant programs and scholarships. The end result is that a Geneva education becomes more affordable for many more students. A first-year applicant is automatically considered for an academic scholarship of between $12,000 and $16,000 per year based on performance in high school and scores on SAT/ACT tests. That could mean up to $64,000 toward a four-year education. Transfer students can benefit from the Tower Scholarship of $12,500 per year, if accepted. To receive priority consideration for Geneva College grants & scholarships, prospective undergraduate students should apply for admission and be accepted to Geneva before December 31. Includes Pro Christo, Founders and Alumni Scholarship. Renewable for up to eight semesters with minimum GPA requirement. Based on SAT/ACT score and high school grades. Renewable for up to eight semesters. Based on Nomination by student’s Geneva Admissions Counselor and renewable for eight semesters. Student needs to be a member of or affiliated with a NAPARC, EPC, CCNA, CMA or affiliated church. Eligible students must be graduates of a Christian high school or Homeschool. Resident of Ohio at the time of admissions application. To be eligible, student must be a resident of Beaver County, PA; First-year students only. Geneva guarantees to cover the outstanding costs of students who are accepted in the fall of the year they graduate from Beaver Falls High School. 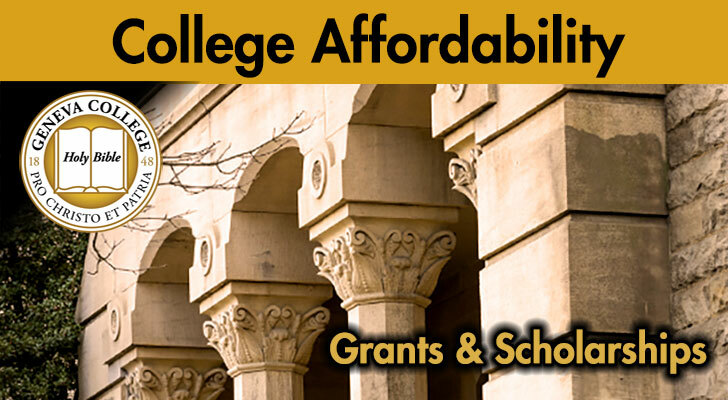 Grants and scholarships are subject to eligibility requirements, restriction of certain combinations, and caps detailed on Geneva.edu. Info on eligibility and current amounts for these and other grants & scholarships are available on Geneva’s Grants & Scholarships page. Students can also get an estimate of total cost of college at Geneva and aid using the Geneva College Net Price Calculator. In a long tradition of creating opportunity for people of all races, color, creed, gender, and socioeconomic background, Geneva is doing what it can to make college affordable. December 31, our priority deadline, is an important date in trying to claim any of these grants & scholarships; applying for admission and being accepted before December 31 is key.